Well, as you can imagine, what I’ve usually brought him is a rap in the mouth, but every once in a while I like to surprise him and give him something he’s not expecting. I stopped at my local independently owned and operated dollar store after work today (I finally remembered to pick up new underpants – it’s been on my “To Do” list for months now.) 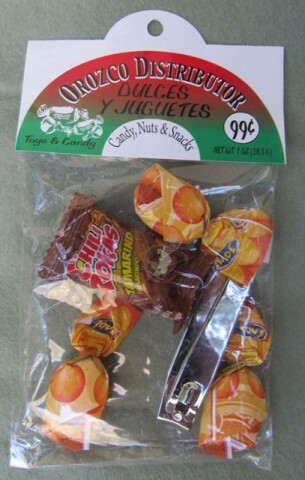 and at the end of an aisle, on an “endcap” as they’re known in the retail game, I saw a pegboard of dulces y juguetes, or in our soon-to-be second language, “candy and toys.” Each little packet had an assortment of a few pieces of candy as well as a small toy. Sure – some candy and a toy. Well, you know little Howard – he loves candy and toys! But which among these many bags – this veritable pegboard of packets, if you will – which one to choose? One had a bright blue yo-yo. Inside another was a cement mixer truck no bigger than your thumb. There was one that had a funny little man on a wind-up horse. And in one packet I saw a red rubber ball with a big white star on it. A handful of tiny green army men were scattered among the candy in one bag. And in another, some plastic zoo animals. Why, they were all wonderful. And I just couldn’t make up my mind. So I did what any man would do, sure. Now, some might say I’m spoiling him, but if you had only seen the expression on his face! Posted by Ted on September 14, 2011, 9:00 AM.